1. 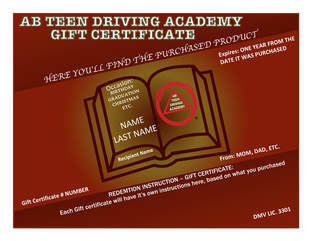 Make your e-Gift Certificate selection at the bottom of the page. 2. Next you will find a calendar, click on the time slot shown. 3. In this page you will enter the information that will reflect in your e-Gift Certificate. Phone: Contact number, incase there is a discrepancy with the information submitted. The occasion: Birthday, Christmas, Graduation Etc. Please ​continue filling the remaining fields and submit your request. 4. Once you have submitted your request you will be directed to the Thank you page, there you will find the service that you are about to purchase. When ready click the PayPal button, if you don't have a PayPal account you may use your debit or credit card as shown in the next step. 6. Here we have a sample of the e-Gift certificate, Terms and Instructions on how to redeem will be printed in the certificate. You should receive your e-Gift Certificate within 48 hrs. Please be advice. Our e-Gift Certificates Expire one year from the purchased date.